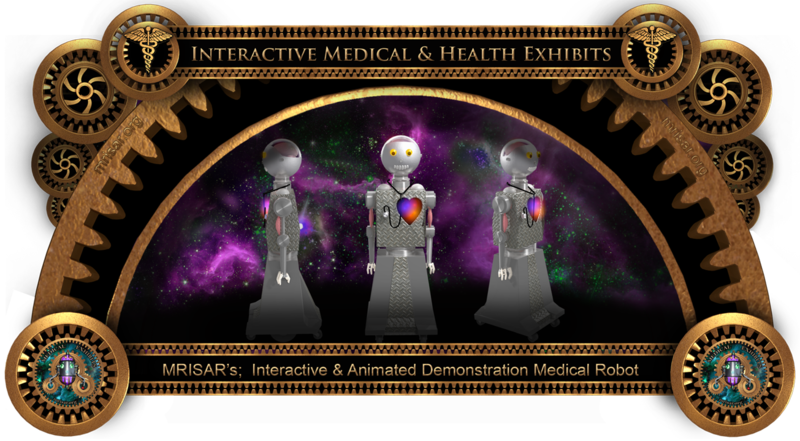 Interactive Medical and Health Demonstration Robot: comes with charger, a set of basic maintenance tools, activity items for the robots automated functions, the manual and the remote for the remote guidance portion of the robot’s system. 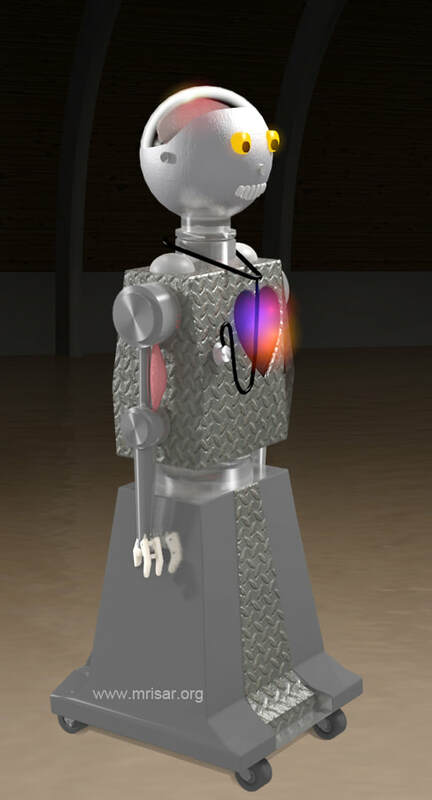 It can be used as an interactive robotic educational assistant and as a mascot for the younger children who visit your facility. The robot features many automatic responses that pertain to health, knowledge of the body and hygiene. The robot will interact in a wide variety of health related activities and respond with speech and motion. The device features an array of sensors that respond to the environment in much the same way as real life forms relate to theirs. The eyes are IR. 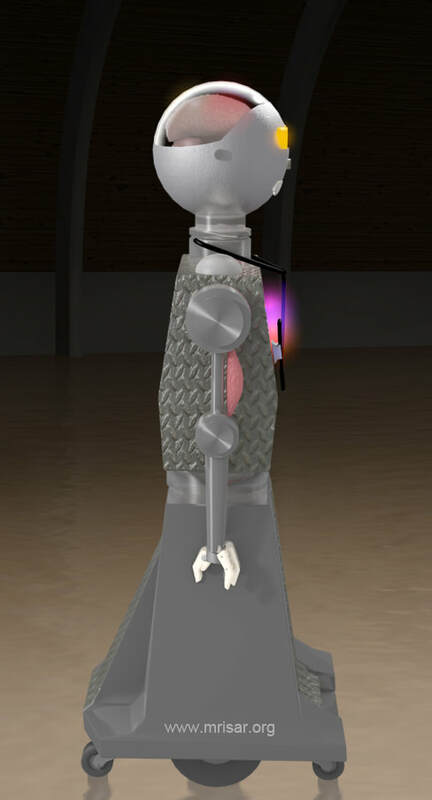 detectors and CDS detectors, the ears are microphone elements, the hands and teeth are equipped with pressure sensors. Each range of motion is equipped with logical limits. Together these elements are combined with a series of servos, two robotic arms and a mobile base. The robot comes with an activity manual, accessories and battery charger. Steering of the robot is done by a discrete remote. The robot is easy to use, maintain and repair. Its source of power is a 12 volt rechargeable, non spillable, gel cell battery. 1- Brush the robots teeth and it will say “Ooo shiny, thank you for helping my teeth and gums to be healthy”. 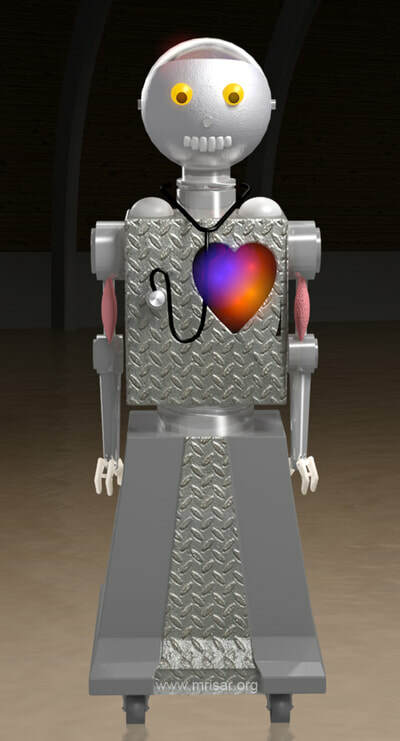 2- Hold it’s stethoscope to your heart and the robot’s heart pulses to your beat and shows the pattern of blood flow with a series of LEDS. 3- An illuminated cut can appear on each of the robot’s arms. The robot says “Ouch! please clean my cut and bandage it.” A special bottle is supplied that symbolizes an antiseptic. When the bottle is squeezed at the cut it stops illuminating and he says, “Time for the bandage” When the bandage is placed it says. Thank you that’s much better!! 5- Have the robot bend an arm and see the rubber muscle seem to pull like a real one. 7- Shine a light at it’s eyes and the robots eyes pivot to look wherever the light goes and the vision center of the brain lights up. 8- Speak to the robot and the hearing center of the brain lights up. 9- Personalize your robot by giving it a name. Tell us what it is and we can record it, so that upon prompting it will say, “Hi! My name is ........”. ​Robot Technical Basics: The robot is an electromechanical/electronic device featuring a number of sensors, servos and interpretive logic. The sensors react to touch, light, sound, IR. and other stimuli. The logical limits prevent over travel. Certain basic functions of navigation are remote control while other specific health related functions are cued in by specific sensors. The main power for the robot is derived from one high density gel cell non-spillable battery. The robot is designed to be totally portable for on site and off site demonstrations. Since each function of each part of the robot is specifically designed for close interaction with people, each range of motion is limited to low torque and supplied with logical limits or other auxiliary safety features. For this reason the robot must only be run on flat surfaces as slanted surfaces may be sensed as a possible person in the way causing the wheel safety mechanism to engage, stopping the robot. The robot is a professional educational demonstration tool. It is designed for supervised use under the guidance of the instructor. The speech function is a Voice Repeater. Recordings can be updated as needed onto an SDHC card. Contact us for price information.